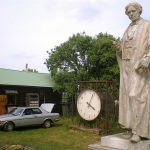 To the Suffolk chapter of the Cabaret club, and a delightful June day with two of the key members, Tim Hunkin and Ron Fuller, makers for whom their workshops are their worlds. Tim first, Ron next time. Southwold Pier, rescued and restored in 2001 by Chris Iredale and then bought by the present owner, Stephen Bourne, in 2005, is one of the Britain’s peers of piers, bringing, Stephen Bourne says, three-quarters of a million visitors a year. 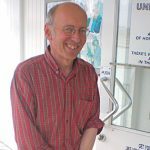 Each morning Mr Bourne must wake and thank god for Tim Hunkin, one of the reasons why they go. 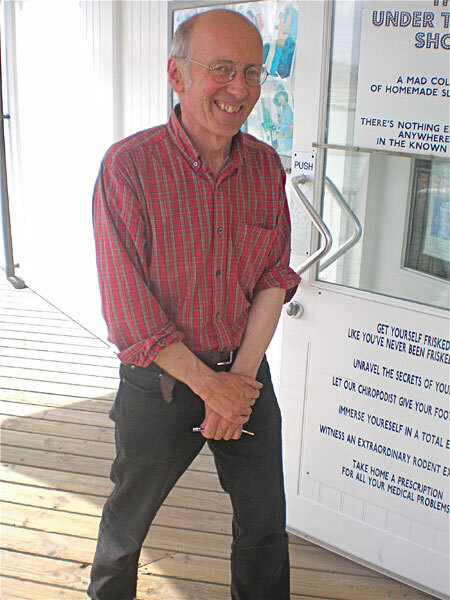 Apart from devising and creating the pier entrance, the open picnic booths, the idiosyncratic water clock and the binoculars at the pier-end, Tim is the creator of the amusement arcade, The Under the Pier Show, so called because of the first amusement was the Bathyscape, devised at the request of Chris Iredale. The Bathyscape is an epic underwater adventure, offering views of estate agents gazumping, canisters of nuclear waste mating, and the opportunity to track down the last cod – reflecting the issues uppermost in 2001 when it was fist installed. 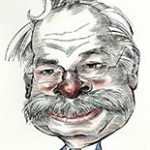 Wit and subversive humour is the USP of what Tim calls his four-dimensional cartoons. A new creation is added each year, with last year’s offering being Whack a Banker ‘A truly rewarding banking experience’ offering ‘unrivalled customer satisfaction, 0% VAR guaranteed, no hidden charges’, in which you are invited to knock five bankers as their heads pop up at random. This year’s is My Nuke in which you have to delicately feed fuel pellets into your Personal Nuclear Reactor using a remote pincer claw. If you fail, The Earth Moves, the radioactive alarm siren sounds, and you are required to call the National Help Centre at £1 a second; if you succeed, you win a slice of nuclear rock, with the radioactive symbol all the way through. You can go on a Micro-Break, which takes you to the Costa Bollente via a bumpy airline flight and a nightmare taxi ride, and back again within two minutes. If you’re worried about security you can get yourself rather intimately searched by the Autofrisk; get yourself fit under the tutelage of a Hollywood star through a new aerobics programme which requires you to lie perfectly still on a bed; or you can Test Your Nerve by attempting to break in where a ferocious alsatian awaits with a truly terrifying experience from which you emerge with your courage rather than your person in tatters. And there are dozens more that will unravel the secrets of your DNA, give you a chiropody treatment, invite you to ‘witness an extraordinary rodent experience’ or take home a prescription for all your medical problems. You can even award yourself an honour. Home is a short drive inland, to a cottage between a secluded woodland and a tranquil lake which has been the Hunkin hideaway for 35 years, a footprint. “To be honest, I’m not that interested in the house: this is where I come alive, in the workshop” he says. Almost as large as the cottage seems to be the suite of workshops where Tim, for 14 years the author of the Observer’s Rudiments of Knowledge strip before giving up to make models, builds his four-dimensional cartoons. 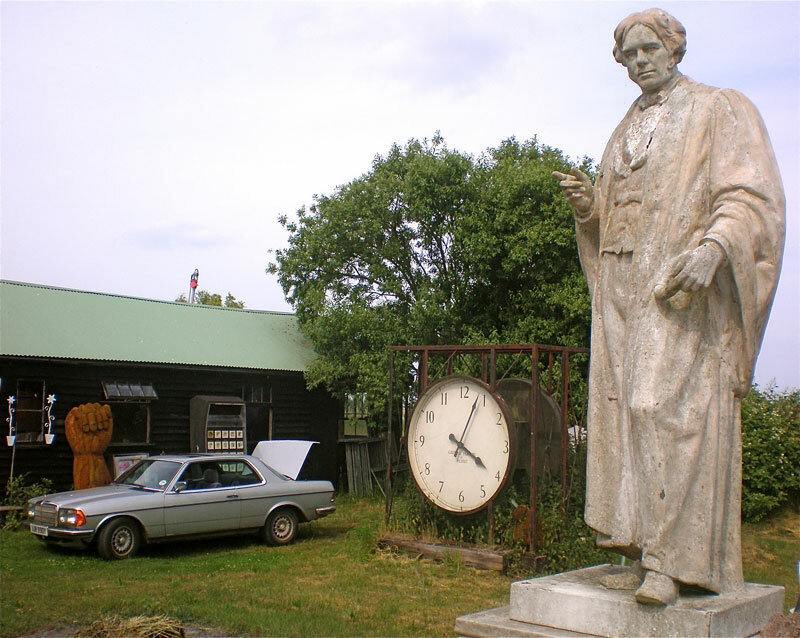 Outside the statue of Michael Faraday he made for an exhibition, stands watch, alongside a giant clock made for another, an over-sized calculator, an enormous carved fist and his ancient Mercedes, passed on to him by a neighbour. On his bench is a figure from the Southwold Pier clock which has been vandalised by, apparently, some French students, a mercifully rare occurrence. “I could make a new one, but repairing it sort of adds to the history of the clock, don’t you think?” he muses. 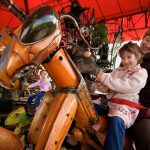 Highlight of the first Milton Keynes Festival on July 16-25 July will be the Manège Carré Sénart, the Magical Menagerie. 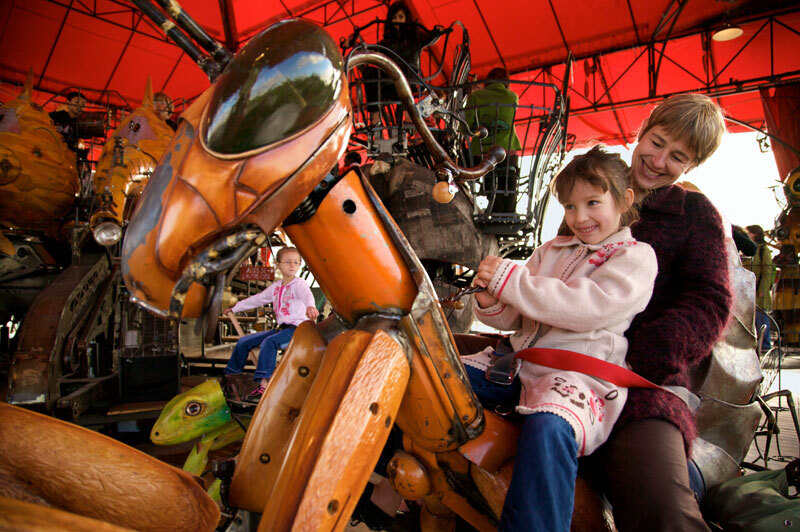 It’s 14 metres tall, covers a 300 metre area and weighs 40 tons, With 18-meter-long sides, an over-300-m area, giving a ride to 49 people on this giant carousel, with three giant buffalos, four climbing insects, ten other insects, three fish heads, and a few jokes. Apart from the enormity and grotesquery, the Menagerie offers one other unique feature: riders can set the whole thing moving themselves. Adults and children can act directly on the elements by activating some parts. If you go down to the woods around Beaulieu Abbey anytime between now and August, you’re likely to come across more than a few moth-eaten teddy bears. 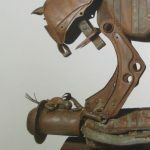 There’ll be this monstrous recreation of a legendary automaton for a start. Tippu’s Tiger was made for the Sultan of Mysore, a serious thorn in the side of John Company 200 years ago. It depicts a soldier of the East India Company being mauled by a tiger, with the animal’s roars ands the man’s pathetic cries reproduced by an organ inside the bopdy of the tiger. It’s in the V&A. 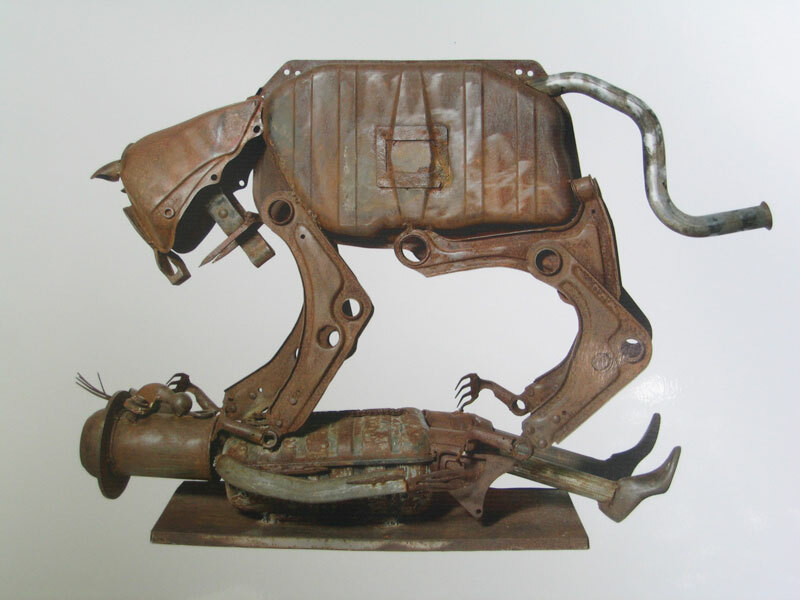 This one has been created by the Gilbert Whyman from welded car parts, and it’s one of 80 pieces in the Surrey Sculptures exhibition there.